Getting ready for a night on the town! Julie doing her makeup on the ferry as we head over to Morehead City. Since our birthdays fall within one day of each other, Julie and I were looking for a way to celebrate them together. We wanted to do a nice dinner on the beach, something fun outside, spend time with our friends and family and eat a super hearty and healthy meal made from locally sourced items. 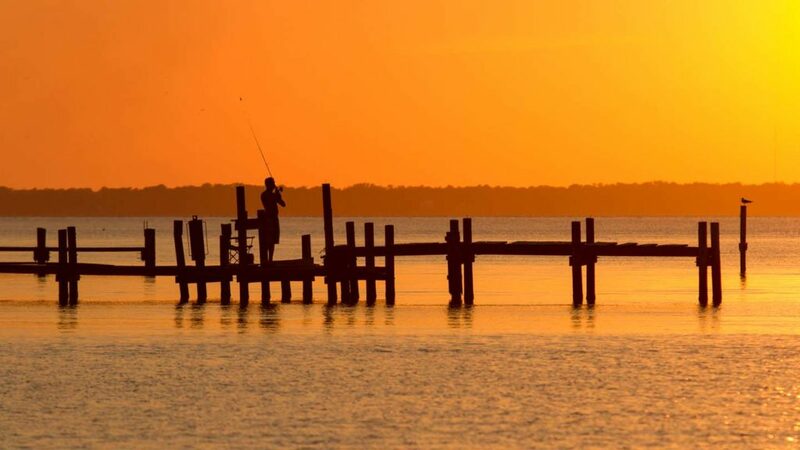 It’s times like these when we feel blessed, if not spoiled to call Pamlico County home. 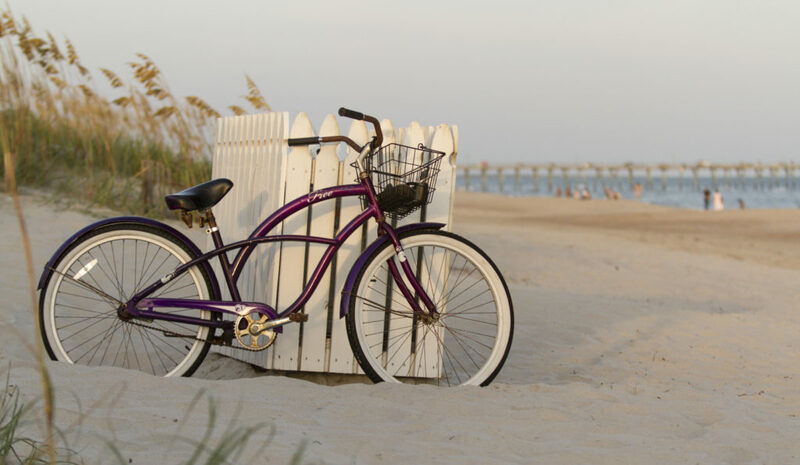 The Crystal Coast beaches are just a free ferry ride and short drive from Arlington Place. 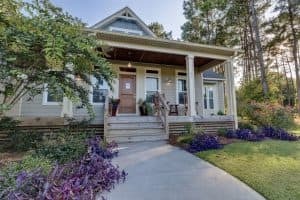 Arlington Place’s proximity to the Minnesott Beach ferry makes it the perfect base for exploring the Crystal Coast. We had our hearts set on a nice meal in the Beaufort, Atlantic Beach, Morehead City area and since I’d never been to the Ruddy Duck, well… the Ruddy Duck it was! It was a slow night at the tavern which was fine by us. We shared the back deck with another couple celebrating a birthday and had a few deep belly laughs together. We were even able to time the ferry just right so we didn’t have to wait long or drive around. The Minnesott Beach to Cherry Branch ferry is a free ride that takes about 15 minutes to cross the Neuse River. Our perfect weekend at Arlington Place continued with a short (and free!) ferry ride from Minnesott Beach to Cherry Branch. 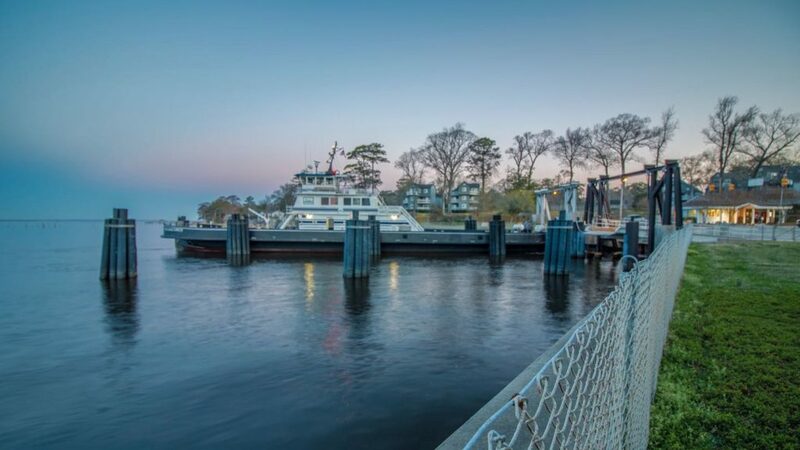 The Minnesott Beach-Cherry Branch ferry takes about 15 minutes to cross the Neuse River and is a huge asset for people living in Pamlico County and working across the river in Craven and Carteret Counties. We were bound for the Neusiok Trail in the Croatan National Forest. The Neusiok Trail is a 20+ mile trail that starts at the Pine Cliff Recreation Area and ends at a salt marsh on the Newport River. 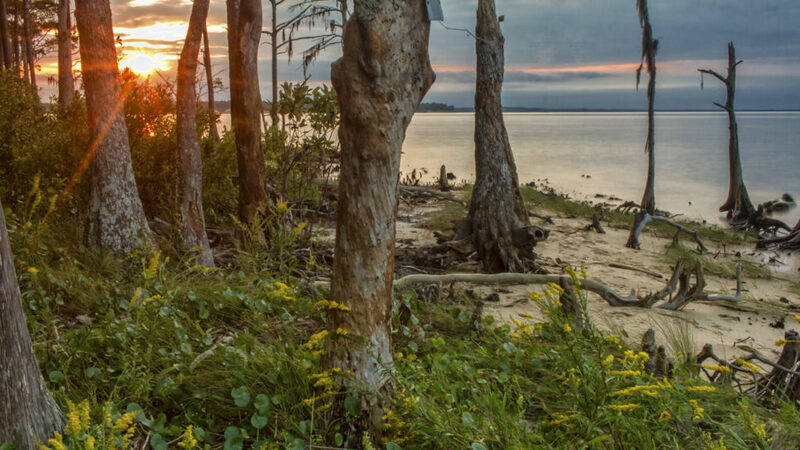 Along the trail you’ll cross cypress swamps, hardwood ridges, longleaf pine savannah and pocosin- shrubby bogs common to the Carolina coast. Our plan was to run the first section for a total of 6.6 miles out and back. 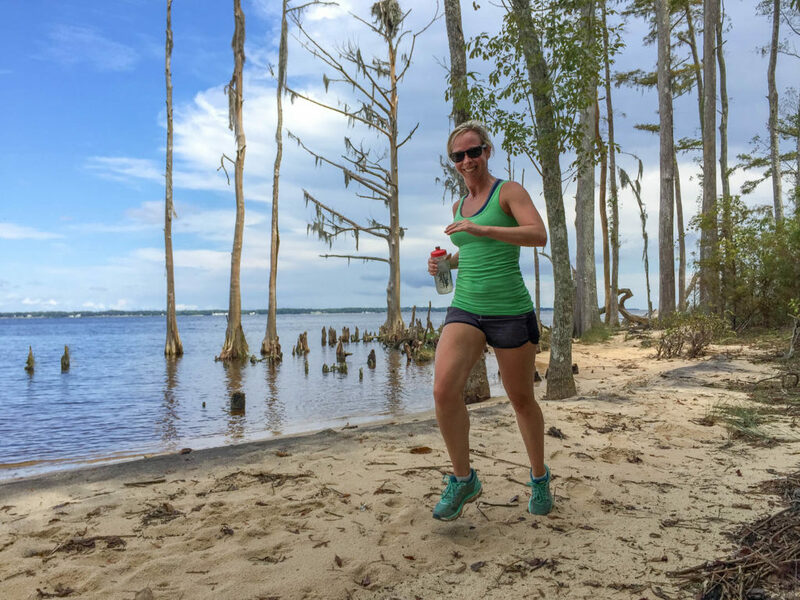 Julie running the Neusiok Trail in the Croatan National Forest just across the river from Arlington Place. A beautiful sunset in the Croatan National Forest as seen from section 1 of the Neusiok Trail. Justin & Christen Lee raise free range grass fed beef just down the road from Arlington Place. Our run ended up being a little longer than expected. Add the chill from a fall rain storm(also unexpected) and we were ready to get some food and recharge our batteries! 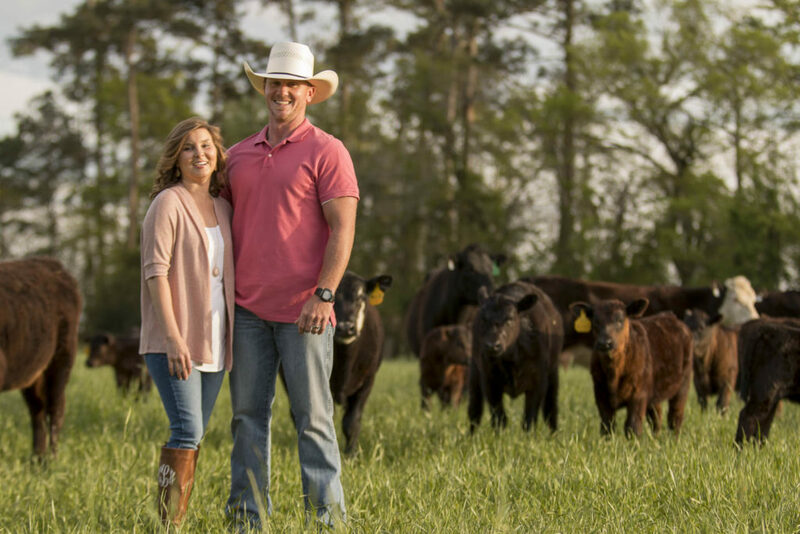 Just a few miles down river from the Minnesott Beach Ferry is the Dawson Creek Cattle Company owned and operated by Pamlico County native Justin Lee. Justin and his family have been farming in Pamlico County for 5 generations. They’ve recently added a grass fed, free range cattle ranch to their operation and sell humanely slaughtered beef products at select local retailers and also at their shop on the farm. We stopped in to pick up some steaks and vegetables for our birthday feast. 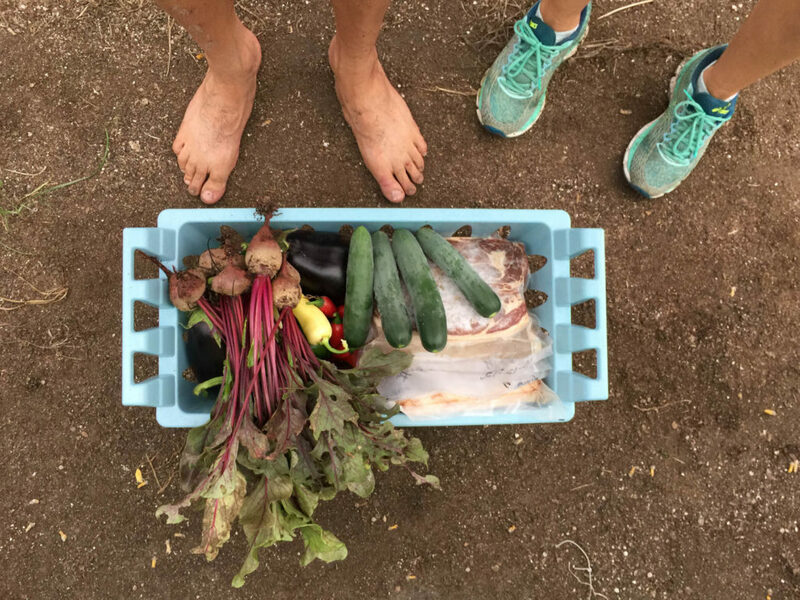 There’s a real sense of satisfaction knowing we’d be later be cooking the same veggies we’re plucking from the vine. 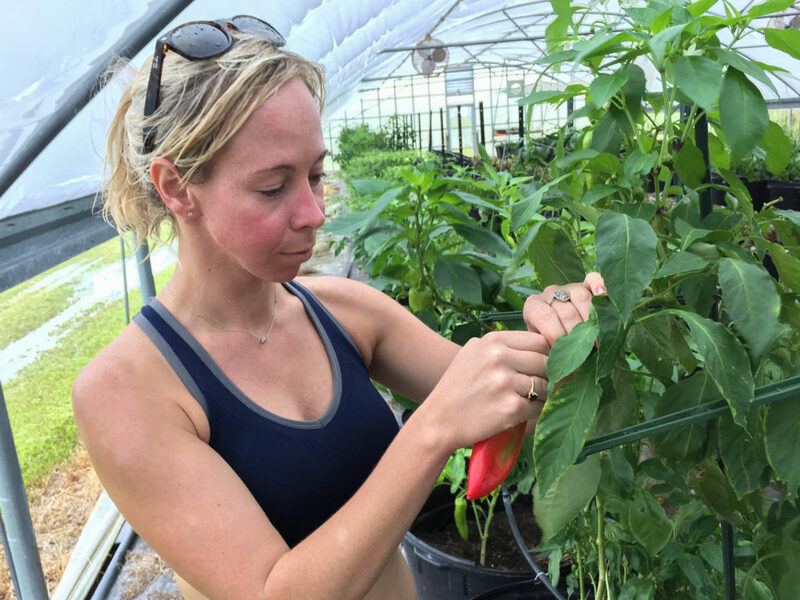 Julie picking the best of the best from the greenhouse at the Dawson Creek Cattle Company. Our bounty from the Dawson Creek Cattle Company. All fresh, all local, all delicious… all good! 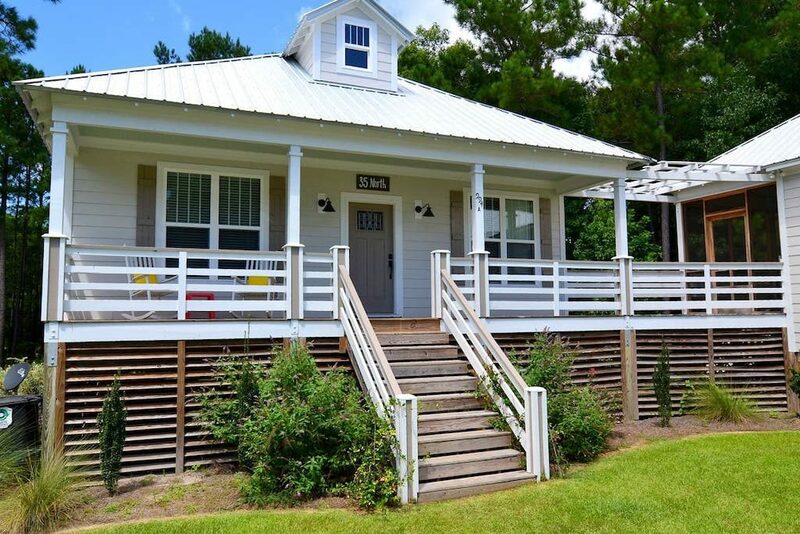 The The 35 North Cottage is one of many Outfitter’s rental cottages at Arlington Place, a vacation destination in Minnesott Beach, NC. We headed back to the cottage to meet our friends from Raleigh and get prepped for the rest of our guests who’d be arriving later. We were renting the 35 North Cottage which had a wide open kitchen and was perfect for entertaining our guests. Even better was its location next to the Outfitters Center which makes handling overflow a breeze! Being this was a small birthday gathering overflow wasn’t an issue for us, but it did prove to be a very useful resource when I realized Julie had taken over the kitchen making Eggplant Parmesan and we needed to use the Outfitter Center grills! 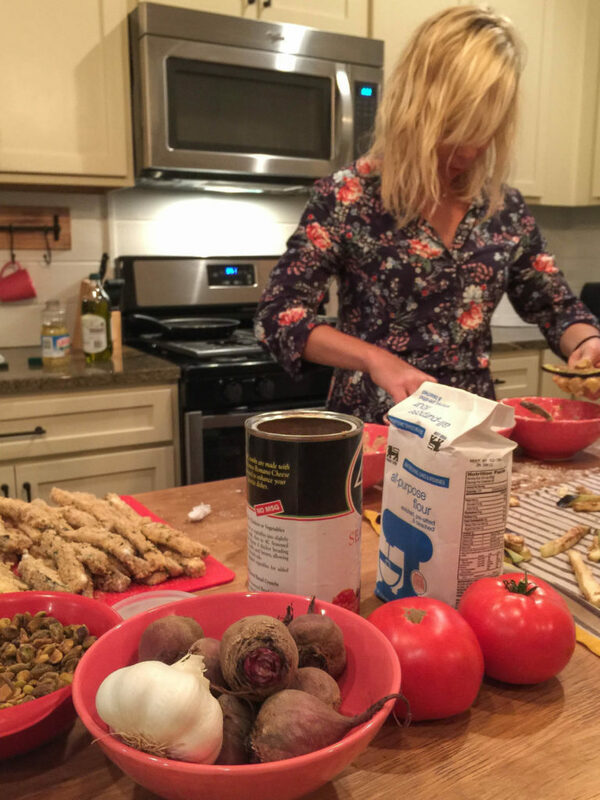 Julie using the amazing kitchen space at the 35 North cottage to prep our birthday dinner. The next morning, ok… the next afternoon, we walked next door to the Arlington Place Outfitters Center which is situated along the banks of Mill Creek. We used the community boats and with the available assisted launch devices, got them into the water and pointed downstream. Mill Creek is like most creeks in the area, calm, placid and surrounded by marsh grasses and teeming with wildlife. I’m not much of a fisherman but I’ve heard this is also a great place to catch Speckled Trout. 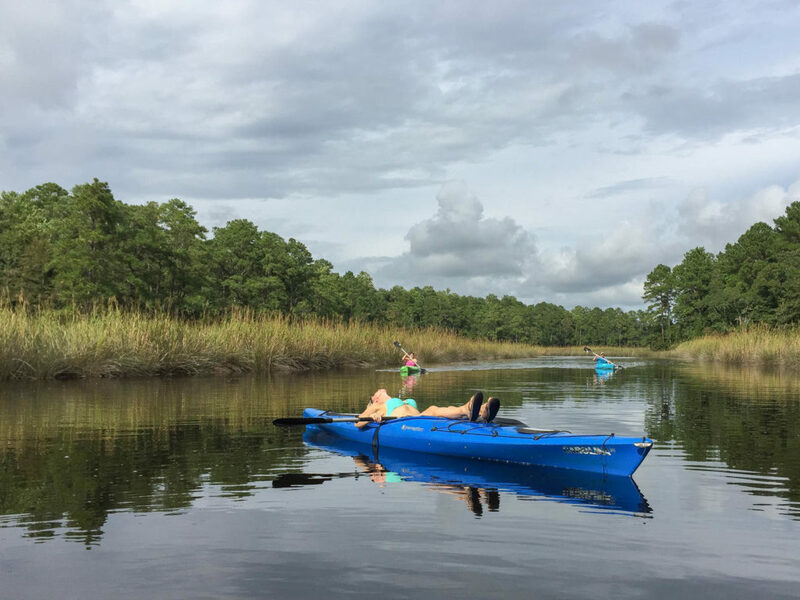 We paddled the smooth waters down to the Neuse River where the open, unprotected environment quickly turned those smooth waters into a violent chop with small whitecaps. Lacking spray skirts and having no desire to sink a boat, we happily paddled back upstream to our launch point at the Outfitters Center and utilized the launching apparatus again for exiting the boats and getting them back on the dock. Paddling the still waters of Mill Creek. 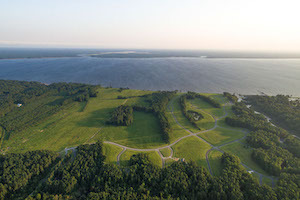 Pamlico County is an amazing place. Come stay with us for a weekend. You might decide you don’t want to leave. Must be relived! As we packed up our gear Julie and I agreed that our perfect birthday weekend at Arlington Place must become an annual tradition. 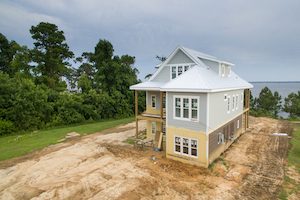 The vibe of the community, the design of the cottages, the access to Mill Creek, the Neuse River, the Croatan National Forest and Neusiok Trail and the short, free ride on the Minnesott Beach Ferry in conjunction with fresh, local, free range cattle were a combination that simply couldn’t be beat for adventurous young professionals like ourselves! 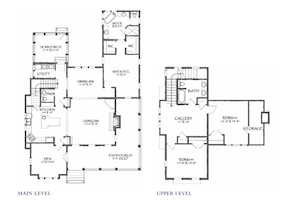 We look forward to celebrating at Arlington Place next year and for many more to come! 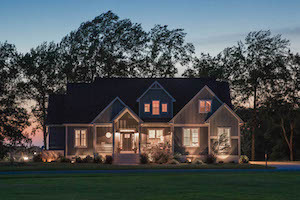 Visit our rental cottage page to learn more about spending a weekend at Arlington Place.